Heat oven to 350°F. Line 9x5-inch loaf pan with cooking parchment paper. Grease bottom only of parchment paper with shortening or cooking spray. In medium bowl, mash bananas with fork. Stir in brownie mix, chocolate syrup pouch (from brownie mix box), melted butter and eggs just until moistened. Pour batter into pan. Bake 1 hour 20 minutes to 1 hour 30 minutes or until toothpick inserted in center comes out clean. Cool 10 minutes; remove loaf from pan to cooling rack. Cool completely, about 3 hours. Like nuts in your banana bread? Add 2/3 cup of chopped walnuts or pecans to the batter. 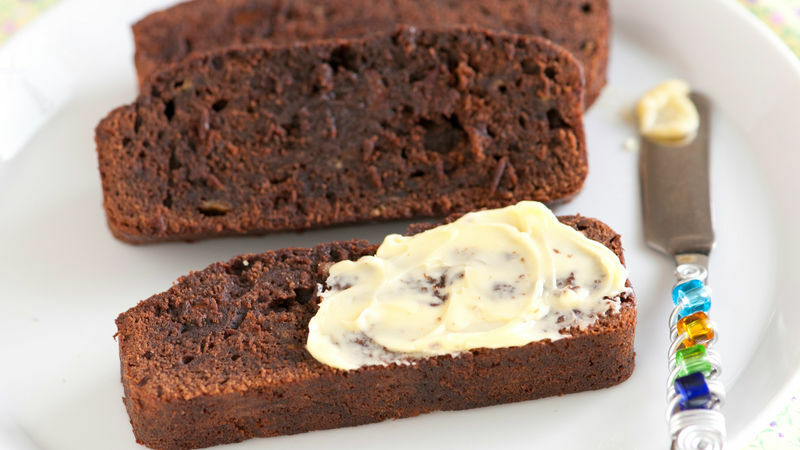 Spread slices with butter or go sweeter and spread with chocolate frosting!